It's also a power-hungry beast, so bring a good PSU and cooler. Intel's fastest ever consumer CPU tops the benchmark charts, but it's not worth the cost. But there’s little reason for anyone to buy this chip for their next PC, other than pure bragging rights. 10 years from now, maybe chips like this will be commonplace, but today? No. Especially if your primary purpose in owning a PC is for playing games, something we wholeheartedly support at PC Gamer. All of your gaming needs can be met on a much less expensive PC without ever running into problems—and at this price, you could potentially build two or even three complete PCs for less than the cost of just the processor. Frankly, even if you’re doing a lot of 'real work' besides playing games, there’s very little that most people do where they would need an 18-core/36-thread (18C/36T) processor. All the usual suspects are of course still applicable—video editing, 3D rendering, compiling code, and other professional applications can all benefit from having more CPU cores. But even though these can make use of additional cores, is there really any benefit to having 18 cores? Going from 2 to 4 cores is an easy sell, and doubling again from 4 to 8 can also pay dividends. Doubling yet again to go from 8 to 16 cores, and then adding two more for good measure to get to 18? Yeah, not so much. This becomes even clearer when you consider other factors. 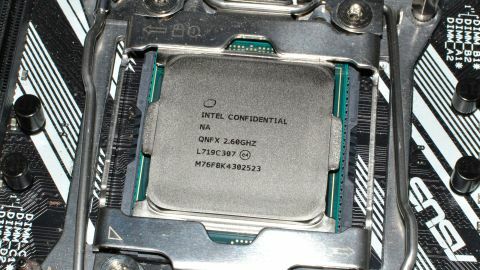 Above are the official Turbo Boost 2.0 frequencies for Intel's X299 CPUs. (Turbo Boost Max 3.0 allows 2-core loads to go 200MHz higher on the Core i9 parts.) If you look at the i9-7960X, which I've covered in a separate review, the i9-7980XE adds 12.5 percent more cores, but it costs 17.6 percent more. It's also running all 18 cores 5.6 percent slower than the 7960X runs its 16 cores, meaning the best-case difference in performance is going to be more like 6 percent. In practice, there are many situations where the difference will be even smaller—the law of diminishing returns is in full effect. Something else to consider is Intel's plans to release its i7-8700K and 300-series mainstream 'Coffee Lake' parts in the near future. The i7-8700K will cost less than $400, so you could buy three of them for under $1200, hit substantially higher clockspeeds, and still have money left over for the additional motherboards and memory you would need. Three PCs for the price of one! And I’m not even sure you would actually end up using much more power going that route. I don’t usually spend a lot of time discussing the amount of power your PC can use, but even running stock the latest Core i9 models are pretty excessive. Nominally, they have a 165W TDP, but the chips I’ve tested all exceeded that mark by a large margin. That’s partly because the motherboard manufactures are playing fast and loose when it comes to honoring the official specifications from Intel, running at maximum Turbo multipliers rather than clocking down to the base clock when necessary to avoid going too far over TDP. Multiple boards won’t even run 'stock' properly—everything ends up slightly to moderately overclocked. And when that auto-overclocking means that your chip could pull north of 300W of power? Yeah, it can get a bit crazy. Maximum stable overclocks, running a CPU intensive workload, my X299 testbed exceeded 500W system power draw on both of the new Core i9 chips. Again, you could likely run three of Intel’s upcoming Coffee Lake processors with higher clockspeeds and lower total power use. Asus's motherboards did the best at respecting specifications, but even stock I was hitting 350W system power draw in CPU workloads on the i9-7980XE. So much for that 165W TDP. From a certain perspective, the Core i9-7980XE is Intel's equivalent of AMD's RX Vega GPUs. It's fast, but it uses way more power than other solutions to get there. The good news is that it generally won't be a lot slower than the less expensive solutions, including in games. But when you factor in the price, there's no way to spin this where it doesn't feel excessive. Overclocking enthusiasts are going to need extreme cooling just to try and keep up with the chip, and the performance benefit over competing solutions like AMD's Threadripper 1950X are relatively small. And for professionals willing to pay any price, I suspect having a system run properly within specifications will be more important than pushing the bleeding edge, making Intel's Xeon workstation solutions a more likely target. Let’s quickly hit the specs table. Intel has now finished rolling out its Skylake-X enthusiast platform CPUs for the time being, giving us seven different options, ranging from the 6C/12T i7-7800X to the 18C/36T i9-7980XE. These run on the LGA2066/X299 platform, and all of them support quad-channel DDR4 memory. The two i7 chips have 28 PCIe lanes while the Core i9 models support 44 PCIe lanes. Besides core counts and PCIe lanes, the SKL-X models also vary in clockspeeds and power draw. Theoretically, you don’t give up too much in clockspeed at identical core count—so the i9-7980XE can do two cores at 4.4GHz compared to 4.5GHz on the i7-7740X—but it seems most of the time the CPUs will run at lower Turbo Boost clocks, meaning ~3.4GHz for the 7980XE. Load up all the cores and it won’t matter as much, but for games there are certainly times where lower priced chips run faster. The mesh topology of the Skylake-X parts also increases latency compared to simpler architectures. If you're not familiar with the term, mesh topology refers to how the CPU cores communicate with each other and with the L3 cache (AnandTech goes into far more detail, if you're interested). Basically, in much the same way that Threadripper underperforms in certain latency-sensitive applications/games, Core i9-7980XE won't always lead in the performance charts. There are additionally two Kaby Lake-X chips (i5-7640X and i7-7740X) that will run on X299, but only with dual-channel memory and 16 PCIe lanes. These are nothing more than tweaked variants of the LGA1151 Kaby Lake chips, with slightly higher clockspeeds and power draw, the idea being you could start with a 'budget' chip on Intel's enthusiast platform, and later upgrade to a faster chip with more cores. There are a few other minor benefits, but X299 is a bit of a confusing mess and you'll want to pay careful attention to your motherboard manual in regards to expansion slots if you're using a KBL-X chip. As you can see in the full details to the right, our testing system for X299 uses an Asus Prime X299-A motherboard, with 4x8GB of G.Skill DDR4-3200 CL14 memory. This is the same RAM I used with Threadripper, giving the CPUs every possible chance to excel. (I retested the earlier CPUs.) For graphics duties, I use the GTX 1080 Ti FE, giving the CPUs an opportunity to differentiate themselves. Finally, all storage consists of SSDs, with a separate (usually M.2) drive for the OS and applications, and a 2TB SATA SSD for games. With that out of the way, I’m going to focus the remainder of this review primarily on the performance of the Core i9-7980XE. I've highlighted both the stock and overclocked results in the charts, and you can compare it with the i9-7960X and other CPUs, including an overclocked i7-7700K. Make no mistake—they new Core i9 CPUs are fast, besting even AMD’s Threadripper parts. But could anything possibly warrant the price Intel is asking? For gamers, the answer is a resounding no. If we focus purely on performance without considering price and other factors, the i9-7980XE and i9-7960X Intel CPUs top the charts in most categories. Interestingly, the 7980XE does poorly in the single-threaded performance, in both stock and overclocked configurations, but the Asus motherboard did seem a few issues with turbo multipliers on the 7980XE—like single-core turbo wasn’t working quite right. (This has been a common issue on many X299 motherboards since launch.) Performance should be identical to the i9-7960X, but my results were consistently slower. Either way, with two additional cores but with a slightly lower maximum clockspeed on those cores, the uplift in going from the 7960X to the 7980XE isn’t all that large—in aggregate, I measured a three percent difference. That final bump from 16 to 18 cores really isn't doing much. And taking things a step further, for CPU intensive workload AMD’s Threadripper 1950X continues to place very well. In some cases, the 7980XE is only 5-7 percent faster than the 1950X, with a 15 percent lead in Cinebench and a 27-28 percent lead in AVX-friendly applications like y-cruncher and the x265 benchmark. As you can probably guess, gaming performance isn’t one of the highlights of the 7980XE. Sure, it can run games well enough, but the i7-7700K is still the fastest gaming CPU in most cases. If that chip isn't enough for your particular workload—like maybe you’re doing CPU encoding of a livestream—I would suggest looking at the 6/8-core i7 parts, maybe Ryzen 7 (if you're not after maximum 1080p framerates), or wait for Intel’s Z370 platform and the i7-8700K. Looking at the individual games, Ashes of the Singularity: Escalation is the only clear winner for many-core CPUs, with the 7980XE beating the 7700K by 20 percent. Dishonored 2 gives a 10 percent lead to the 7980XE, and Hitman an eight percent lead, but everywhere else it's a tie or slightly worse. On the other side of the scale, Dawn of War 3 shows a 20 percent performance advantage for the 7700K, and Far Cry: Primal gives a 12 percent lead. Far Cry is a bit of a special case, however, as it refuses to run if you have more than 20 total CPU thread—I had to disable eight of the 7980XE's CPU cores to get the game to run at all, similar to what I had to do on Threadripper. Looking at the gaming picture as a whole, you can get a small boost in performance in a few games by having a many-core (6+ cores) solution, but overclocking is a much easier/cheaper way to get that same level of performance—or more. This may change over the coming years as newer games begin to leverage additional CPU cores, but it's only in the past couple of years that we're getting to the point where most games really benefit from quad-core CPUs, and those have been around for about ten years. It’s cool that you can still hit 4.1 GHz on 18 cores, and with additional cooling I’m sure you could push things further. But you would need more than just additional cooling—like some seriously beefy power delivery to your CPU. As I mentioned above, the i9-7980XE testbed is pulling over 500W when overclocked (576W in Cinebench R15 to be precise), which is nuts. Threadripper 1950X overclocked to 3.8GHz by comparison 'only' uses 422W in the same test, though there's a sizeable 25 percent performance lead for the i9-7980XE. The i9-7900X also uses a similar 425W, with a much higher 4.6GHz clockspeed, so the extra cores on 7980XE definitely come into play. To get 4.1-4.7GHz 'benchmark stable,' I ramped up fan speed on the Corsair H115i AIO CPU cooler to near maximum (which is pretty loud), the pump is running full speed, and still the CPU gets close to 100C under heavy loads. In other words, this isn't really what I consider a safe overclock for 24/7 use, and I would say 3.9GHz on all cores is a better limit. I also had to use a -4 AVX/AVX512 offset on the multiplier, as otherwise the system would hard reset—it was probably drawing too much power from the VRMs. Different motherboards might change the equation, but power draw is still going to be way up there. I had the best luck with using the 'Auto' CPU voltage setting on the Asus board, which appeared to range from 0.8V up to 1.25V on the various cores depending on CPU load. Trying for a static 1.2V didn't work (Windows failed to boot), though giving a 0.05V offset voltage did seem to help in some cases. Basically, Intel has binned Skylake-X to get the best CPU dies for the i9-7980XE, and higher voltages are going to push temperatures and power draw into the red zone. With the overclock in place, the i9-7980XE ekes out a small overall lead in gaming performance compared to an overclocked i7-7700K. If you have multiple high-end graphics cards, like GTX 1080 Ti or Titan Xp, the additional PCIe lanes offered by Core i9 processors can also help, particularly at 4K resolution, but there are enough major games where SLI/CrossFire fail to work that multi-GPU increasingly feels like a poor solution to gaming performance. No one should be surprised by the results for the Core i9-7980XE. Given it uses a slightly tweaked version of the 14nm lithography found in the previous generation i7-6950X, power use was always going to be a factor. If you're in the niche market where you want as many CPU cores as possible, running at the highest clockspeeds possible, this is the new champion in the World's Fastest CPU competition, but it comes with some serious caveats, not least of which is the price. Flip over to the gaming side of things and the i9-7980XE becomes even more specious. There's effectively no overall improvement in game performance when moving beyond the i7-7700K—individual games might run a bit faster on the i9-7980XE, others faster on the i7-7700K, but it's a net wash. But you get all that for only six times the price! If you want more than a 4C/8T Intel CPU for gaming, I'd strongly recommend the i7-7800X as the more sensible alternative, or wait for the i7-8700K which will arrive next month. Fundamentally, the Core i9-7980XE is about bragging rights, on multiple levels. There are the bragging rights for anyone wealthy enough to buy one, and bragging rights for anyone crazy enough to overclock one with an extreme cooling solution (I can't wait to see the LN2 and LHe results that will inevitably appear!) But most importantly I think, this is about bragging rights for Intel. "Yes, AMD, we see your 8C/16T Ryzen 7 processors, and your 16C/32T Threadripper 1950X. We can beat you on per-core performance, clockspeeds, and core counts, because we have 18C/36T!" Will AMD eventually counter with a 24C/48T Threadripper, or go whole-hog on a 32C/64T rebadged Epyc processor? Then Intel can counter with it's even more ludicrous 28-core parts! Part of me wants that to happen, but the practical side of me just sadly shakes my head. The bickering and one-upmanship is getting a bit silly. But if you want the absolute fastest CPU around, right now that crown belongs to the i9-7980XE. And you still don't need one.